Although knowledge on (fancy) goldfish is slowly spreading, there is still a lot of confusion when it comes to their identification and requirements. Many people still think they can be kept in bowls (which is not the case) and they are frequently mislabeled in stores. Because of this, new goldfish owners often have no clue what type of goldfish they actually have swimming around in their aquarium. If you’re a bit confused as to what type of goldie you have or if you’re trying to figure out which type you like most, keep reading for descriptions of the more common goldfish varieties. Note: For more info on how to care for (fancy) goldfish, check out the Fancy Goldfish Caresheet. Single tails have a longer body shape than fancies and, as the name suggest, a single tail instead of a double one. They grow very large and are active swimmers, which makes them most suitable for ponds. These are the typical orange goldfish that are sold as feeders or given out at fairs. They usually end up in a small bowl and die after a few days/weeks, which is a pity, as they can live for up to 20 years when properly cared for. Keep your common goldfish in a pond, as they are supposed to grow to a size of almost 12 inch (30 cm). Commons come in many different color varieties, including orange, yellow, “wild” color (brownish) and white. Their patterns can range from an even color to all kinds of color combinations and spots. Comets are quite similar to commons, the only difference being their tail – Comets have much longer, flowier tails. Their requirements are the same, as Comets can also reach huge sizes and are therefore unsuitable for aquariums, vases and bowls. Like commons, Comets can have many different colors and patterns. Very similar to comets when it comes to tail and body shape, Shubunkin can be recognized from their color and pattern – they only come in calico. They were developed in Japan around 1900, and have since been bred into three different varieties that can be told apart by looking at the tails. American Shubunkin have long, comet-like tails, London Shubunkin have a tail that is more similar to that of a common and more recently developed Bristol Shubunkin have a long, heart-shaped tail. Like commons and Comets, Shubunkin are best kept in ponds due to the size they can reach. Double tailed goldfish are usually referred to as ‘fancies’. Most types are much rounder than single tailed goldfish and have all kinds of interesting features. Because they stay smaller than single tails and are usually less active swimmers, the rounder fancy types can be kept in certain types of aquariums. A minimum of around 20 gallons per fancy is usually recommended and since they cannot be kept alone, you’re looking at an aquarium of at least 40 gallons. Because goldfish produce a lot of waste, heavy (double) filtration is also a good idea. Although most types of double tailed goldfish have round bodies and are suitable for aquariums, there are two exceptions. Wakin only have slightly stockier bodies than single tails, but are easy to recognize from their small, double tail. They are not kept much outside of Japan, although they do pop up in local aquarium stores now and then and can often be bought online. If you manage to obtain one, it’s not a good idea to keep it in an aquarium. Like single tails, Wakin are supposed to grow very large. A pond is a much better idea. Even more rare than Wakin, Jikin are very hard to find because it’s nearly impossible to breed a perfect specimen. They are supposed to have a long body, like a single tailed goldfish, but with a double tail with a 180° spread. The color should be white with red on the ‘points’ (tail, fins, mouth, gills). Because this specific color pattern is so hard to breed, some Jikin are treated with chemicals to remove any red parts that are in the wrong places. I have personally only seen real-life Jikin at fish shows. If you want one, try talking to a local goldfish importer to see if they can find them for you. To ensure a long, healthy life, keep your Jikin in a pond. Fantail goldfish are similar to Wakin, with the exception of a longer tail and a much rounder body. They are among the most popular types of fancies and can be found in almost every pet store. Because they stay smaller than long-bodied goldfish types, fantails can be kept in aquariums as long as their requirements are met. Keeping them in ponds is also possible, because they are strong fish that usually have no problem surviving the winter. Fantails come in endless colors and patterns, although regular orange seems most common. Veiltails look a lot like regular fantail goldfish, but with much longer, flowier fins. In fact, the tail sometimes grows almost twice as long as the body! The name comes from the veil-like appearance of the tail when the fish swims, which looks very elegant but also makes the fish weaker than other types of fancies. To prevent the fins from collapsing, ensure the filter flow isn’t too strong. Veiltails are best kept in aquariums, as they are very slow swimmers and don’t usually do too well in ponds. They come in almost all colors and patterns. Available in long- and short-finned versions, Ryukin are similar to fantails with the exception of a big hump just behind the head. They are among the biggest types of fancies, with show quality specimens needing up to 130 gal (500l) to grow out nicely without stunting. In regular aquariums with pet store quality Ryukin, try to go for 25-30 gallons (95-114l) for each one. A pond is also a possibility, as Ryukin are quite hardy. Ryukin come in all types of colors and patterns, although red and white seems to be the most common. Tosakin, famous for their huge, curly tail, are a rather rare type of goldfish with very specific requirements. They often have a hard time swimming properly, especially older show quality fish, and therefore should be kept in shallow indoor ponds or tubs so the fins don’t collapse. Water quality should be very high, as Tosakin are very sensitive. All in all they are beautiful fish that look incredible when viewed from above, but definitely not something for beginners. Telescope eye goldfish are named after their big, bulging eyes, that are caused by a genetic mutation. They come in a few different subtypes like Butterfly (with a butterfly shaped tail), Black Moor (a completely black telescope eye) and Demekin (a Ryukin with telescope eyes), that all have similar requirements. Because they don’t see very well, you should always keep an eye on your telescope eye to ensure it gets enough food. From my personal experience I have learned that it’s easiest to just keep your telescope eyes with only other telescope eyes so there isn’t too much competition for food. Sharp decorations like plastic plants or pointy gravel should be avoided, as the eyes are easily damaged. Telescope eyes are very popular and can be found in most pet stores. They come in various colors and patterns, including more exotic ones like panda, chocolate and purple. Oranda, often mistakenly labeled as Lionheads, are easily recognized by the brain-like growth on their head. This headgrowth, called a ‘wen’, is the result of selective breeding. Oranda are one of the larger fancy goldfish varieties, so 25 gallons for each one of them is a good idea. A pond is also a possibility, as they are quite strong. When setting up an aquarium or pond for an oranda, skipping the substrate is a good idea. These goldfish, especially the more extreme ones, may get small grains of sand in their wens when foraging. This can cause irritation and in bad cases even infection. Oranda are one of the most popular fancy goldfish varieties so it shouldn’t be too hard to find one. The size of the wen depends on the quality of the fish, although any well-cared for oranda may suddenly sprout a huge headgrowth over the course of a few weeks. My own Leon is a great example of this. Oranda come in all kinds of colors and interesting patterns; red-cap orandas, for example, are completely white with a red wen! The name of the Pompon, also sometimes referred to as Hana Fusa, is derived from from the enlarged nasal bouquets. They look just like little pompons on the nose of the fish. Pompon goldfish come in two different varieties; one with a regular dorsal fin and one without a dorsal. Both are rarely seen in regular pet-/aquarium stores, which is a pity, because they are strong fish (especially the variety with a dorsal fin) that come in lovely color patterns like chocolate with orange pompons. Ranchu, often confused with Lionheads due to their similar looks, are round, dorsalless goldfish with a wen encasing the entire head. Ranchu were first developed in Japan, but are now quite popular throughout the world – well-bred Ranchu sell for crazy prices! Ranchu come in two different varieties: side-view and top-view, both with slightly different features. Both can be kept in both ponds and aquariums, although top-view fish are more specifically meant for (indoor) ponds than side-view ones. Ranchu are available in almost every color. They are quite popular, although high quality fish are sometimes difficult to find in local pet stores. Lionhead goldfish look almost the same as Ranchu, with a few small exceptions. They have a bigger, less smooth wen and are less round, although the difference can be very difficult to spot. Lionheads are less popular than Ranchu and often more difficult to find; don’t be fooled by the label ‘Lionhead’ in stores, as they will often call everything with a headgrowth a Lionhead. This rather extreme variety is named after the round, pearl-like scales. What is most striking about them, though, is their roundness! Pearlscales are bred to be extremely round and fat, with some subtypes like Tiku Pearlscales looking almost like tennis balls as they age. Pearlscales are available with and without headgrowth; the ones with a wen, called Crown Pearlscales or Hamanishiki, have one or two smooth “blobs” on their head. Pearlscales are steadily gaining popularity and can be found in some pet-/aquarium stores. They mostly come in red/white and calico, although all colors are possible. Celestial goldfish look much like regular telescope eyes when they are very young, with the exception of a missing dorsal fin. As they age, however, their eyes will start turning upwards until the fish is constantly looking at the sky (which is where the name comes from). Celestial goldfish are not a very popular variety because they are often seen as too extreme. The ones found in local pet stores are often skinny and badly bred, which doens’t contribute to their popularity either. A well-bred Celestial can actually be a beautiful fish, although you don’t come across them often. Celestials mostly come in regular orange, although other colors are also possible. Bubble eyes are quite similar to Celestials – the difference is in the eyes. Bubble eyes have eyes that are turned upwards, but they are of normal size. Under the eyes is a sac filled with water that grows bigger as the fish ages. These sacs are very fragile and can burst when touched by a sharp object, so the best type of aquarium for a bubble eye is a barebottom tank with only smooth, round rocks and soft plants like Anacharis. If one of the sacs does burst, care should be taken to prevent infection and it will usually grow back. This often results in an asymmetrical fish, though, so always try to prevent bursting. Bubble eyes are best kept with other Bubble eyes or Celestials; other fancy goldfish are usually too fast and may eat all the food before the Bubble eye gets a chance. Red/white and orange Bubble eyes are most common, although other colors and patterns like calico and panda are also possible. With all the different types of (fancy) goldfish available both online and in pet stores, there is always one for you. Just be sure not to run out to the store immediately; do some research on how to provide your new goldie with the care it needs first. If you’re still not sure what type of goldfish you have or which one is suitable for your aquarium/pond, feel free to leave a comment below and I will try to help you out. I know that you probably won’t see this but I need help identifying my goldfish. I saw her in Wal-Mart and she looked sad so I got her. She was labeled as a Miscellaneous. At first, I thought she was a red cap Oranda because she has a white body, a redhead, and the double tail. But, she doesn’t have a fin on top of her. I’m confused but I hope you know something that could help me. 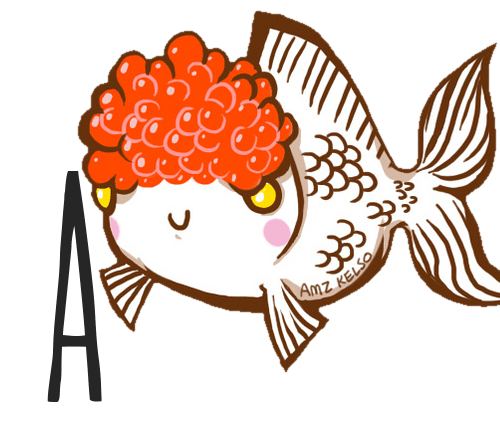 Hi Ava, that sounds like either a lionhead or a ranchu. Did you not find it anywhere in this article? Also, if you bought the fish on impulse, do you have the supplies needed to house it? I really recommend against buying fish on impulse unless you have a cycled and suitable aquarium ready to go. I also don’t recommend buying ANY fish from locations like Wal-Mart because you don’t want to support their terrible husbandry. Fancy goldfish need 20 gallons per fish and should always be kept with at least one friend, which comes down to a 40 gallon minimum. The tank should be heavily filtered and fully cycled (if you don’t know what that is, it’s explained here). They can’t be kept in tropical community tanks and need a single-species setup. If kept in a smaller, uncycled or improperly filtered aquariums they run the risk of becoming stunted in their growth and/or ill, which can become fatal. You can find a full fancy goldfish caresheet here. The use of videos to help novices with type ID is a great help. Frankly I still can’t ID all the types in out tank. The simple ones are Comets & Black Moors. Mostly it’s the more egg shaped bodies that present problems for me. Some single tailed others double, definitely no lion head features, ordinary eyes, etc ………..
Is it the case that many pet shop bought fish are in fact crosses that can’t be ID as one specific type? i have a 1000 gallon pond about 8ft by 12 ft. Having not read enough about varieties of gold fish, i simply purchsed some pretty, colorful or different looking fish in pairs. i believe i have 2 boggle eye or telescopic eye (black), and a few other fantail species of different calico type colors. i also added some single tailed goldfish who have grown some absolutely gorgeous long flowing tails (different colors, some solid gold, some calico.. and had at one time two of what i call bobble heads due to the odd growth on their heads. But seem to be missing one. I planted grasses, placed several rock shelters and assorted other plants like lilies and elephant ear type plants and horse tails. along with a few plakos of which I’m only seeing one large who is now coming up to feed on the pellets. I have both a waterfall filtration system and a pump to bring the water down a small creek thus allowing for ample oxygen needs when i can keep it working that is. I of coiursewill plug in a bubbler when it goes down to keep oxygen levels good. so being as they apparently are triving and breeding, i have several smaller fry, some a bit larger and two new adults that have been growing. my last fish count which i do at night when the underwater lights are on and i can gather them to one area to do a half arse count lol. Im up to probably over 30 fish. I would glady like to begin removing or thinning out some of the fish, but no sure how to go about this with out losing the ones that may be of value if there are any. All appear to be happy and now i am also learning about adding other natural foods like fruit bits, or veggies as well as brine shrimp for a good balanced diet. I see an occasional fish chase between mostly the straight tails, and although i have found one egret in my pond trying to eat, my dogs pretty much keep them at bay before they bring more friends for an easy meal. Winter is also coming here in central florida and temps can get down to below freezing for several hours but rarely longer than that.since my ponds deepest part right now is only about 2-2/1/2 ft deep i was told by my local pond guy to simply add a slow flowing hose near the bottom of the pond during the colder months or freezing days and said they should be fine. I dont think he knows how many different varieties of gold fish i have though. any suggestions on how to handle my dilema? of how many to keep and which varieties? i do love my fantails and the large long flowing tails on the single tails. Hi! Your pond sounds very nice! As for your other problem with the fish breeding too much, that’s something we’re struggling with in our pond as well. The population explodes every year and there are now way too many fish in there. Goldfish don’t really have much “value” money wise unless they’re professionally bred to show standards, so that’s not something you have to worry about. You may be able to rehome some to other people with ponds! If you do choose to rehome, I would definitely get rid of either the single tails or the fancies because you are right in that they are not an ideal combination. They are not aggressive to each other but the single tails are faster and when you keep them together, the fancies may be outcompeted for food. Lastly, plecos are not great pond/tank mates for goldfish as they are known to damage them occasionally. You may want to keep a close eye on that! For more info on goldfish you could check out the Goldfish category on Aquariadise!